Scattered storms are expected to form and/or move into the Mid-South from the west during the late evening, most likely after 8-9pm. Some of these cells will likely form into one or more "mini-lines" of storms as they race northeast at 50-60 mph. This is the more uncertain part of the forecast. There is a "lid" or cap on the atmosphere this afternoon, keeping storms from forming. If this cap is not broken before the main line gets here, these scattered storms may NOT form. We expect to see something - we just don't know the degree to which these storms will form and how strong they may get. However, much more certain is that a squall line will be moving across Arkansas during the late evening hours and will move through the metro probably between midnight and 2am. 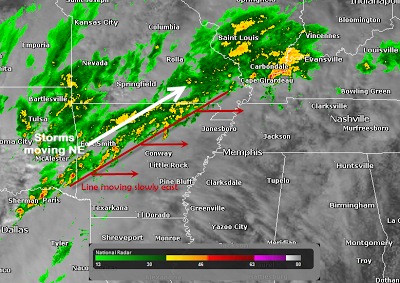 The line will also be moving rapidly east and will be followed by a period of heavy rain and embedded thunderstorms. Most of the rain should be gone from the metro by sunrise. For a complete forecast, including what to expect in the next 7 days, click here. In any storms that form ahead of the main squall line, all forms of severe weather will be possible, including damaging wind in excess of 60 mph, large hail, and tornadoes. In the squall line, the most likely form of severe weather will be 60-80 mph straight-line wind and brief "spin-up" tornadoes that can occasionally form within the line, as well as hail. Any storms behind the line are not expected to be severe, but heavy rain will be likely for a few hours after the squall line (which will also bring torrential rain). Total rainfall amounts could exceed 1-2" in a short period of time and flash flooding is possible, though not particularly likely due to the fast movement of the storms. Severe weather risk maps for tonight. For tornadoes, wind, and hail, the probabilites indicate that chance of that phenomena occurring within 25 miles of any point. 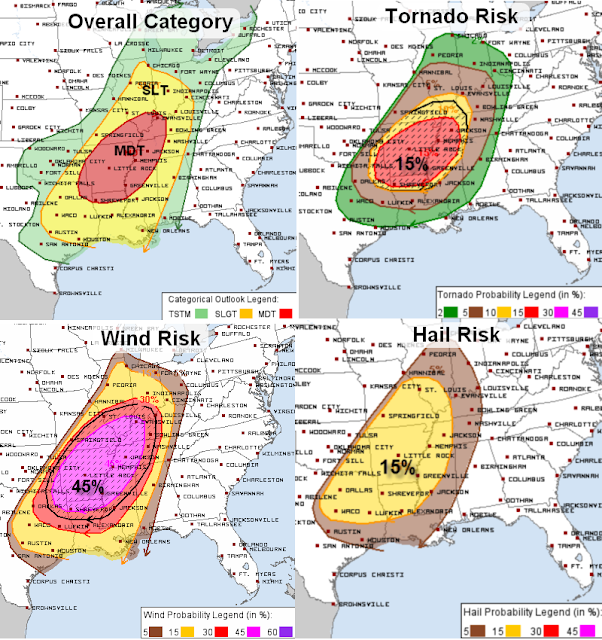 Memphis has a 15% chance of a tornado, 45% chance of damaging wind (60 mph+), and 15% chance of 1" or larger hail. 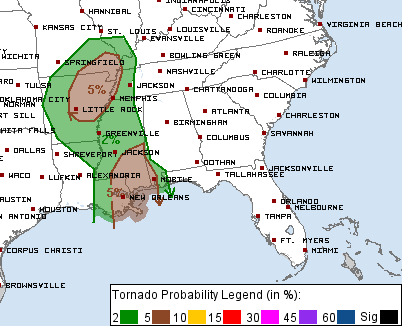 The hatched areas for tornadoes and wind indicate there is a 10% or greater chance of an EF-2+ tornado or 75 mph wind within 25 miles of Memphis. Do not wait until a warning is issued to prepare for severe weather. Prepare NOW before the threat is on us, including having at least one way of receiving warning information while you sleep. That should NOT include expecting to hear outdoor warning sirens. With wind blowing and rain pouring while you sleep, you will likely NOT hear them. They are called outdoor sirens for a reason (it's not because they are located outdoors). Have your cell phone charged in case the power goes out. In your safe place, have flashlights and extra batteries and something to do to wait out the storm. If you have kids, also have shoes for them, bicycle helmets (for flying debris if God forbid something happens), something to occupy them, and maybe a snack and water or a drink. The best way to get severe weather info if you have a smartphone is to download a weather warning app that will A) alert you for Severe Thunderstorm and Tornado Warnings, B) wake you up if you are asleep, and C) preferably warn you only if your location is under the warning. We don't care which one you get as long as it meets A and B, and preferably C. However, we highly recommend the MemphisWeather.net mobile app for iPhone and Android. The StormWatch+ feature within MWN meets all three criteria above, is reasonably priced, and the app contains a ton of other content that will keep you updated any time you need good, reliable, LOCAL information that you won't find on a "national" app produced by an out-of-town provider with no customer support. Download the app and get used to it's features. You'll be glad you did if the power goes out and storms are overhead! App note: For iPhone/iPad users, to hear the wake-me-up feature of StormWatch+, do NOT silence your phone. Apple does not allow sound from push notifications when a device is silenced. For Android users, push notification sounds will sound if your device is silenced. This is a situation that should not be taken lightly. We have not been under a threat of this magnitude since last January. IF a Tornado Warning is issued for your home and you have children asleep, don't panic. Wake them and calmly head to your safe place. A reassuring voice and words go a long way to keeping everyone calm. We'll provide continuous coverage of the storms via Facebook and Twitter (links below) tonight as long as there is a threat. We won't rest, so that you can! We'll have more detail later on as we continue to examine model data, but the first large-scale severe weather event of 2013 could unfold on Tuesday into Tuesday night from the ArkLaTex into the Lower Mississippi Valley, with the potential for severe storms as far north as central IL/IN. 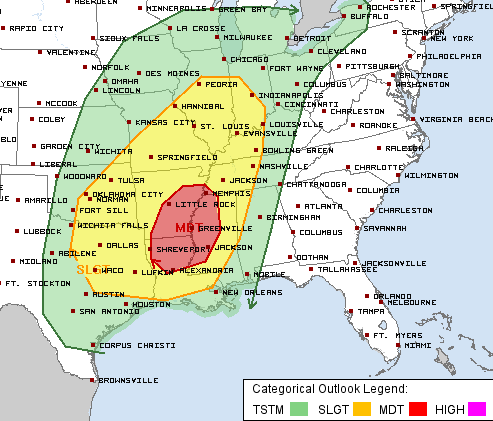 The first Moderate Risk area of 2013 includes the Memphis metro. This is valid Tuesday into Tuesday night. Storms are expected in the metro on Tuesday night. 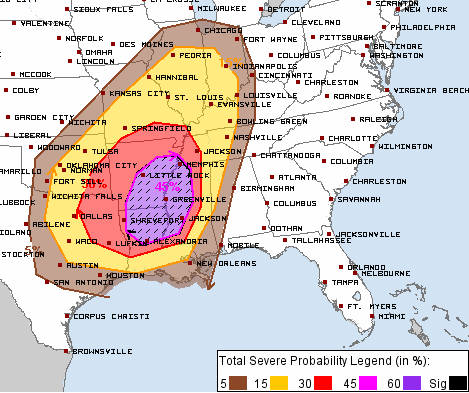 Probabilities of severe weather with Tuesday's severe weather event. 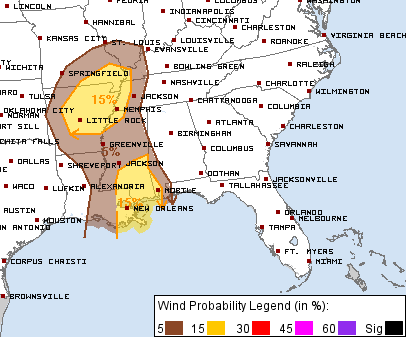 A "45% hatched"area for the metro means that there is a 45% chance of severe weather within 25 miles of any location in the area and a 10% of greater probability of that severe weather being "significant" (very high wind or large tornadoes). There are still model differences that have to be ironed out, including exactly when to expect the severe weather in the metro, but we do know that it will be after dark and most likely in the 9pm-3am time frame Tuesday night. All modes of severe weather are possible with the #1 threat being a squall line with excessive and damaging wind of 60-80 mph. It appears that wind just a couple thousand feet off the ground will approach, or possibly exceed, 75 mph. In convective situations, it is not hard for these winds to be shoved to the ground, producing widespread damage. There will also be a threat for tornadoes with this event, though the risk is lower than damaging wind. Typically in squall line events such as this, tornadoes are brief and weak, but a "weak" EF-0 to EF-1 tornado can bring wind in excess of 100 mph. They are typically very hard to pinpoint very long before they occur because they are fleeting. Any storms that form during the evening hours ahead of the main line would pose a higher risk of tornadoes. Do not wait until a warning is issued to prepare for this potential severe weather event. Prepare today and tomorrow before the threat is on us, including having at least one way of receiving warning information while you sleep. That should NOT include expecting to hear outdoor warning sirens. With wind blowing and rain pouring while you sleep, you will likely NOT hear them. Make sure your NOAA Weather Radio has fresh batteries. Get more safety tips from MWN here. The best way to get severe weather info if you have a smartphone though is to download a weather warning app that will A) alert you for Severe Thunderstorm and Tornado Warnings, B) wake you up if you are asleep, and C) preferably warn you only if your location is under the warning. We don't care which one you get as long as it meets A & B, and preferably C. However, we highly recommend the MemphisWeather.net mobile app for iPhone and Android. The StormWatch+ feature within MWN meets all three criteria above, is reasonably priced, and the app contains a ton of other content that will keep you updated any time you need good, reliable, LOCAL information that you won't find on a "national" app produced by an out-of-town provider with no customer support. Download the app today and get used to it's features. You'll be glad you did if the power goes out and the storms are overhead! We'll have more information later today and tomorrow. Be prepared, not scared! As discussed yesterday, we had two chances of light icing in the area - one was this morning (which didn't materialize and had a very low probability anyway), and another is tonight. The prospects for ice in the metro tonight are also looking less likely, which is a good thing because the precipitation chances and amounts are higher than they were last night! The situation, in a nutshell, is this: a cold front that moved through overnight last night has stalled to our south and will begin moving north again tonight, as low pressure moves into the region from the west. In the wake of the cold front, temperatures in the 30s are common, as you know if you have stepped outside today. It's cold! 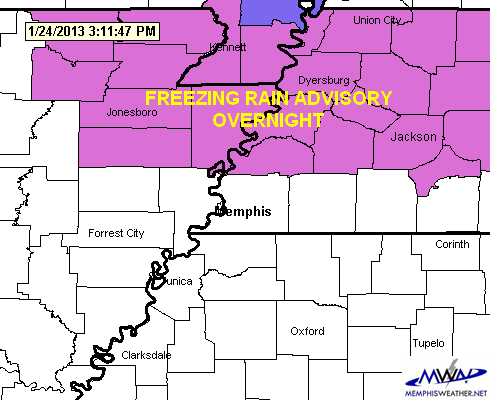 A Freezing Rain Advisory is in effect for northeast AR, the MO bootheel, and west TN north of I-40, excluding Shelby County. Light freezing rain and hazardous travel conditions are possible, especially in northern portions of the advisory area, overnight. Thanks to cloud cover and wind that will be slowly shifting from east to southeast, temperatures are not expected to drop much overnight though. 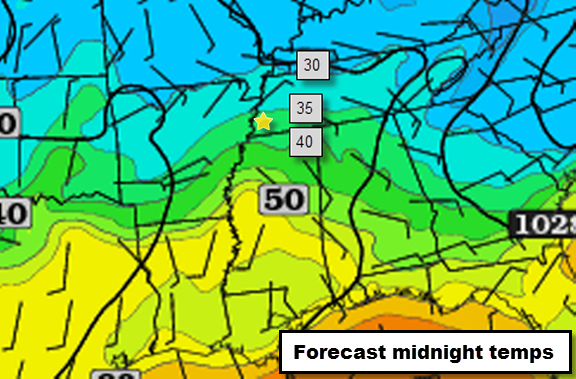 In fact, low temperatures will likely be reached before midnight, then will slowly rise during the overnight hours. Precipitation is expected mainly after midnight. With temps rising overnight, the vast majority of the metro will remain above freezing all night and any precipitation will occur as plain rain. Midnight temps (about when precipitation develops) should be above freezing for the metro according to this hi-res short-term model (RAP) graphic. Greens are 35+, light blues are 30-35. NOAA predicts that any significant icing (more than 0.10") will be found across the northern tier of TN, well north of the metro. The high-res NAM model predicts temps (red line) to remain above freezing (dashed blue line) in Memphis tonight with precip (green boxes) falling between midnight and noon. Diagram is read from right to left (starting at 7am Thursday on the right and continuing past 7pm Friday on the left). The threat of freezing rain diminishes to near zero after dawn tomorrow morning, while rain showers stick around through mid-day as temperatures rise into the mid 40s. If you are traveling early Friday morning east on I-40 towards Nashville north into northwest Tennessee, we recommend watching weather conditions in those areas closely. 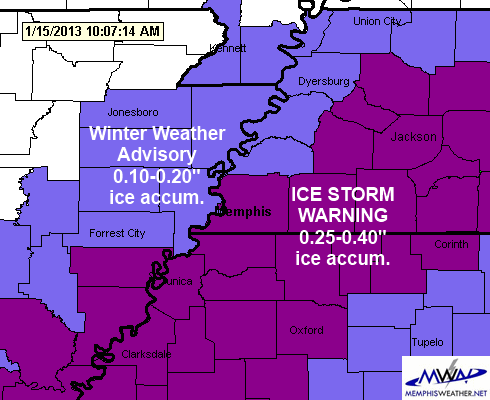 Icing is more likely north and east of Jackson into middle TN and northern AL, especially before noon. We'll continue to monitor new weather data as it arrives and let you know if we see any changes via our social feeds below. You can always get the latest on current and forecast weather conditions via our mobile apps as well. Download them via the links below. Tonight, a cold front will move through the area bringing a bit of moisture with it. Though the air is pretty dry, there could be just enough moisture to squeeze out some light rain overnight, mainly after midnight. Chances are low (20-30%) that we'll even see any precipitation and temperatures are expected to be above freezing through the nighttime hours (though falling through the 30s). However, it's possible that any precipitation still lingering around at daybreak or shortly thereafter could pose a minor issue with low temperatures expected to be near freezing from 6-9am tomorrow. Again, the chance of any precipitation in that time frame is very low - probably 10%. Most of Thursday will be dry and cold with temperatures in the wake of tonight's front remaining in the 30s all day. Wind chills will be in the 20s. Thursday night, another more significant round of precipitation will develop as low pressure approaches the area from the west. Most of the precipitation will occur after midnight (early Friday morning) and continue through the morning hours Friday. The potential for freezing precipitation is, again, very low, but we'll have to watch temperatures from midnight until about 6am Friday. We are forecasting temperatures in the 33-36 range during this time period, and slowly rising. Just to our north however, temperatures will be a few degrees colder. Northwest Tennessee and northeast Arkansas are at a greater risk of light freezing rain/icing early Friday. Below is a probability map for light freezing rain from 6am Thursday to 6am Friday (covering both potential icing periods) and it shows the chances of light freezing rain to be almost zero in the metro, but above 50% in northwest TN. Probability of freezing rain of 0.01"or more between 6am Thursday and 6am Friday. Notice probabilities increase significantly just north of the metro. MWN will continue to monitor the situation and bring you the latest information on our social channels listed below. For the complete forecast, click here. An Ice Storm Warning is in effect from 9am today to 6am Wednesday for much of the metro, including Memphis and Shelby County, Fayette Co, and all of northwest MS, including DeSoto, Tate, Tunica, and Marshall Co. A Winter Weather Advisory is in effect for Tipton Co and Crittenden Co. The National Weather Service is calling for 0.25-0.40" of freezing rain (ice) for the warned area, with lighter but not insignificant amounts for Tipton and Crittenden Counties, as well as much of northeast AR. Areas southeast of the metro will see freezing rain initially this morning, changing to rain as temps climb above freezing. In the metro, temperatures will likely remain at or below freezing the entire day (high temp: 31-32). Very few of the details in last night's blog post have changed. Precipitation is expected to move in from the south, reaching MS counties in the metro after 9am and likely push across the MS/TN state line by 11am-noon. The heaviest icing will occur during the afternoon hours, primarily from 2pm-6pm, with some light freezing rain or freezing drizzle continuing through the evening until around midnight. While it's possible we won't see quite 1/4" of an inch of ice in the metro, it will be enough to warrant the Ice Storm Warning in our opinion - likely at least 0.15-0.20". We're not going to quibble over 0.05" when a significant impact is expected. Freezing rain accumulations of 0.25" are likely this afternoon and some locations will see higher amounts of up to 0.40" ice. Early morning reports indicates some bridges and overpasses are still slick and more freezing rain (on the order of 5-10 times as much as yesterday's 0.04") will make travel and commerce difficult at best by this afternoon. If amounts get close to 0.25", and Coupled with a 10-15 mph wind, there will likely be power outages from ice on power lines and trees that lose branches. Plan ahead for the possibility. Temperatures will not get above freezing until Wednesday morning after 9-10am when Mother Nature will be able to assist in ice removal via melting. Plan ahead for the likelihood of hazardous travel conditions in the afternoon and evening. Have an ice scraper in your vehicle when you leave home in the morning and plenty of gas in case your afternoon commute takes longer than usual. Know your alternate routes in case bridges are iced up. And above all, be patient, drive slowly and carefully, and watch out for the other guy! Finally, stay with MemphisWeather.net for the latest on this developing winter weather event, including our nowcasting on Twitter and Facebook. The MWN mobile app has StormView Radar with precipitation typed by color so you know what to expect, as well as latest conditions from multiple metro locations, and StormWatch+ severe and winter weather alerts for the latest warnings and advisories. Links to our services are below. I would add these two things to the above - 1) If you are able to leave work, or otherwise be at home, after noon today, we strongly encourage it. 2) Those who remember the 1994 Mid-South Ice Storm - that was nearly 2" of ice. This is NOT that bad (by a long shot), but nonetheless significant in these parts. What likely was just round 1 of "Winter Weather Week 2013" brought a whopping 0.04" of freezing rain and sleet this afternoon (with some snow flurries at times), but delivered a TKO to many in the metro as bridges and overpasses iced up and exposed surfaces glazed over. Even as I write this, some 5 hours since the last sleet pellet hit the ground, bridges over the Mississippi River are backed up for miles. 1. Precipitation amounts are expected to be higher in the metro. 2. Temperatures appear to be slightly warmer. 3. Precipitation duration will be longer. 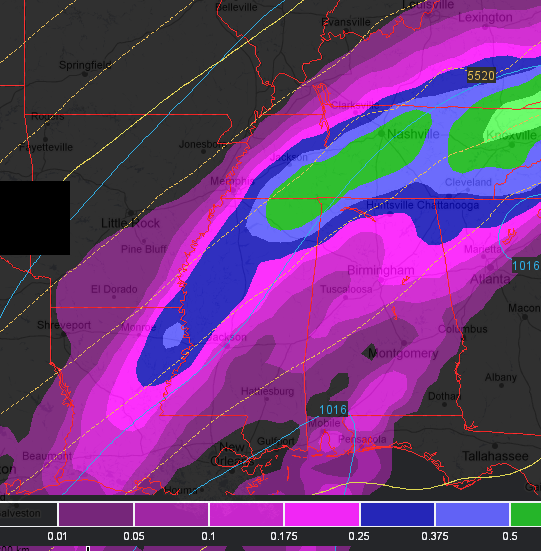 18Z GFS model precipitation total forecast from noon-6pm. Much of this precipitation would be in the form of ice. The National Weather Service has extended the Winter Weather Advisory for most of the metro to 6pm Tuesday, while Marshall and Tate Counties, and points east and south, are now under a Winter Storm Watch. The delineation between the two lies at the 1/4" accumulation mark - a watch was issued for areas expected to get more than 1/4" of ice, the advisory for less than 1/4". Expected impacts: Moderate - glazing of ice on trees and power lines that could cause spotty power outages and hazardous conditions on elevated road surfaces and possibly secondary roadways if precip is moderate for short periods of time. The most hazardous conditions will be from mid-afternoon through rush hour if temperatures stay at or below 32. In sum, tomorrow's winter weather event has the potential to be more hazardous than today's, but not quite to "ice storm" level, if temps do not reach 33+ for a couple of hours in the afternoon. We already know what 0.04" of ice looks like. Plan ahead for the likelihood of hazardous travel conditions in the afternoon and evening. Have an ice scraper in your vehicle when you leave home in the morning and plenty of gas in case your afternoon commute takes longer than usual. Know your alternate routes in case bridges are iced up. And above all, be patient, drive slowly and carefully, and watch out for the other guy that doesn't read this blog! 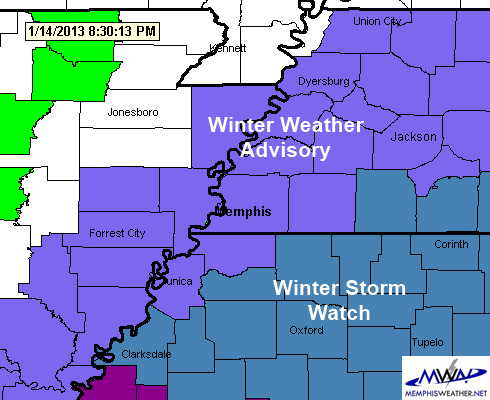 A Winter Weather Advisory has been issued for the metro from 10am today until noon Tuesday. For more details on the atmospheric setup regarding this event, please refer to last evening's blog post. Our general thought process has changed little since then. I've pasted the text of the Advisory from the NWS below. However, in our estimation, we feel that this is a very conservative forecast based on continuing disagreement among the computer models and issued for an area larger than the metro where conditions could be worse than they are locally. Plan ahead, especially for your afternoon commute. Have an ice scraper in your vehicle today. Allow extra time for travel and, if precipitation has fallen or is falling, leave plenty of distance between you and other vehicles and do not make sudden lane changes or brake quickly. Icy spots can come up quickly and with little warning. There will be a lull in the precipitation this evening and most of the overnight hours. Another round of precipitation will be possible Tuesday, with most of that falling from mid-morning to afternoon when temperatures are expected to be above freezing. Some of this precipitation could also start off as very light freezing rain early Tuesday morning. Stay with MemphisWeather.net for the latest on this developing winter weather scenario, including nowcasting on Twitter and Facebook during inclement weather. Links to our services are at the end of this post. AM THIS MORNING TO NOON CST TUESDAY. * ICE ACCUMULATIONS...FREEZING RAIN ACCUMULATIONS OF LESS THAN ONE QUARTER OF AN INCH ARE EXPECTED...MAINLY ON TREES...POWER LINES AND ELEVATED ROAD SURFACES. * IMPACTS...SOME DAMAGE TO TREES AND POWER LINES WILL BE POSSIBLE. AND HAZARDOUS ROAD CONDITIONS WILL DEVELOP ON BRIDGES AND OTHER ELEVATED ROAD SURFACES. WIDESPREAD HAZARDOUS ROAD CONDITIONS MAY DEVELOP IF PRECIPITATION IS MORE INTENSE THAN CURRENTLY ANTICIPATED. Rain has ended across the metro (FINALLY!) with rainfall totals near 3" since midnight across Shelby County and higher amounts in other locations around the metro. 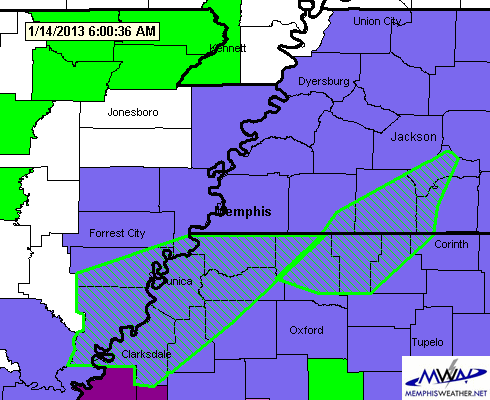 Multiple Flash Flood Watches, Warnings, and Advisories were issued due to rising creeks and rivers and urban flooding on roadways and low-lying areas. Thankfully now that rain has moved out, water can recede and you can turn in the keys to teh ark you rented. 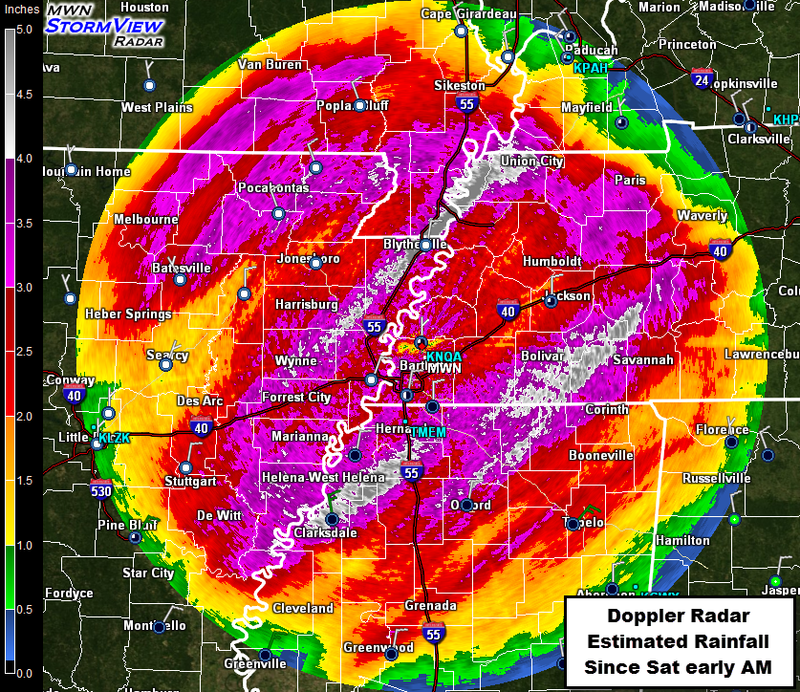 Doppler radar estimated rainfall since early Saturday morning. Many locations saw 3-5" of rain this weekend! Our attention now turns to the cold weather and possible precipitation in the cold sector, versus thunderstorms and flooding in the warm sector! The huge front/trough that moved through early today is still hanging out just to our east and another wave will ride along the front on Monday. However, since we're on the cold side of the front, there are two concerns: 1) how close will the precipitation get (and how much if it gets here) and 2) what will the temperature profile look like when and if it does arrive. These questions cannot be answered definitively tonight, even though we're less than 24 hours from the precipitation event, as computer models are really struggling with this scenario. GFS model sounding of the atmosphere at 3pm Monday. Temperature scale along the bottom, height going up, red line is temperature as one ascends above ground. The blue line is freezing. 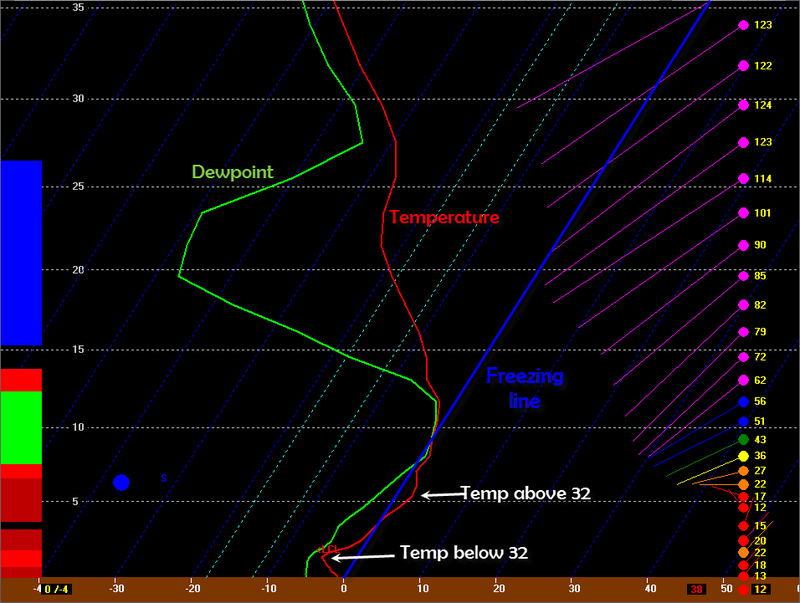 The red line is below freezing up to about 4,000', then above freezing tot about 9,000', then below freezing again. This indicates that precipitation that forms around 10,000' will be liquid until it gets below 4,000', then freezes, resulting in a wintry mix (freezing rain or sleet). Not all models agree with this one, thus the lower confidence in the forecast. Given our best educated guess and what little consensus there is in the model data, we expect to see temperatures bottom out in the upper 20s tonight then struggle to reach freezing tomorrow afternoon. (With expected north wind, look for wind chills to stay in the upper teens to lower 20s all day.) Precipitation will be most likely just southeast of the metro, over north MS, but we expect some amount of it to reach at least a part of our coverage area. The best chance will be over Tate/Marshall/Fayette Counties, though there will also be about a 50/50 chance of precip for the rest of the metro, including Memphis & Shelby County, DeSoto County, and Tipton County. The most likely time for precipitation will be from noon util 6pm Monday. As for precipitation type, surface temperatures will support multiple precipitation types, none of which are rain. Temperatures is the lowest few thousand feet above ground will determine what type of most likely, and that is where model discrepancy comes into play. Our best guess right now is for a mix of snow and sleet, possibly mixed with freezing rain. All precipitation should be light and total accumulations would likely max out at a half-inch of snow/sleet and a very light glaze of freezing rain. Probabilities of accumulating freezing rain (0.01"+) Monday. The metro is in the 40% range. MWN expects primarily light sleet and snow. We'll keep you posted via our social channels below. A welcome reprieve from wet weather is occurring this afternoon, which will continue into the evening hours. Only a low chance of a shower is in the forecast through about midnight. However, it will remain very warm and sticky. This morning's rainfall was courtesy of a weak wave of low pressure moving along a very slow moving cold front draped across AR. That wave has moved by, while another more potent low is forming further down the front. It is triggering scattered strong storms from NE Texas into far SE Oklahoma and western and central AR. At mid-afternoon, a line of thunderstorms is forming across AR that will move slowly east, arriving in the metro after midnight. Individual storms are moving northeast along the line. No organized rain is expected locally until this line arrives. The Storm Prediction Center expects those storms to strengthen further as the afternoon and evening progress and could issue a Tornado Watch for much of the Slight Risk zone that extends from SW to NE across the state. Storms are moving northeast along the line (called "training" of storms because the cells are like railroad cars, following one another along the track) while the line itself shifts slowly east pushed by the slow-moving cold front. 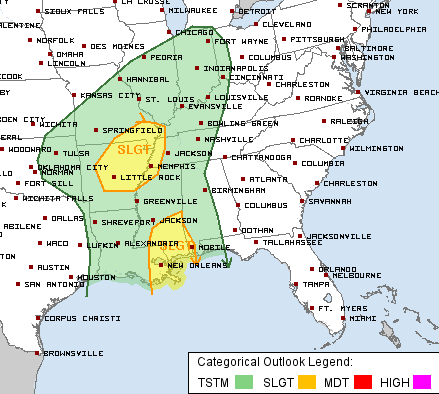 The Slight Risk zone extends into the western portions of the Memphis metro, west of I-55 in AR and far northwest MS and north of I-40 in west TN. A Slight Risk area covers a good part of AR and the western metro. Damaging wind and an isolated tornado are possible in the slight risk area overnight. Within the Memphis metro, showers and thunderstorms will move in after midnight with the heaviest rain and any potential severe weather most likely between 2-6am Sunday. The timing of the line does not typically portend a high threat of severe weather. But with temperatures still well into the 60s, dewpoints in the 60s, and a gusty south wind ahead of the line, this front, with its 40-degree temps behind it, will be strong enough to bring a threat of damaging wind and an isolated tornado in any storms that accompany it. Perhaps the most widespread threat will be heavy and continuous rain that could drop an inch or more in just a couple of hours. With saturated ground already, flash flooding could be an issue, thus a Flash Flood Watch remains in effect until noon Sunday. Rain is likely to continue through the morning and early afternoon hours Sunday before tapering off by late afternoon. Rainfall amounts could total 1.5"-2" locally by Sunday evening. In addition, temperatures will plummet behind the front, likely falling 20 degrees within an hour or two of it's passage. Most of the day Sunday will be spent in the 40s, or 30 degrees colder than today! Expected rainfall amounts from 6pm Saturday through 6pm Sunday. 1.5-2" amounts are likely in the metro. We'll have more tomorrow on the possibility of winter weather Sunday night or Monday as models struggle to determine whether precipitation occurs or not and how cold it will be. In any case, it does not appear to be a significant issue at this point. With the threat of severe weather overnight, it will be a good idea to have a NOAA Weather Radio and StormWatch+, our pinpoint severe weather notification system within the MemphisWeather.net mobile app, at the ready. StormWatch+ will wake you up if a severe thunderstorm or tornado warning is issued, but only if it is for YOUR GPS-determined location. DO NOT count on tornado sirens to wake you up - they won't. NOAA Weather Radios go off for entire counties, waking you even if you're in Millington and the warning is for Collierville (which is better than nothing at all). But StormWatch+ is accurate enough to know if you are in the severe weather polygon determined by the National Weather Service. If you're not, it'll let you sleep. Download the app for iPhone or Android via the link below. What a gorgeous "spring-like" day today! After a couple of wet days, a mostly sunny, warm day is just what the doctor ordered as we head into a weekend that will easily be described as inclement, some night say a "split personality!" It will definitely be a tale of two airmasses as a potent cold front splits weekend weather in half. A strong cold front positioned directly over the Mid-South Sunday morning will make for a tale of two weather patterns this weekend. Showers move back into the weather picture late tonight as a resurgence of moisture arrives from the south. 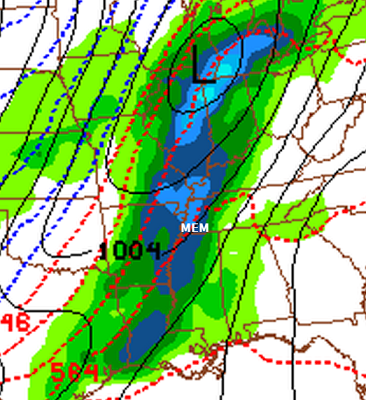 On Saturday, a very slow moving cold front will bisect Arkansas from northeast to southwest and waves of low pressure will ride along it, bringing a wet day to the Mid-South. One low pressure wave will bring a round of steady rain and some thunderstorms during the morning and early afternoon hours as it moves by to the west, dropping a half-inch to an inch of rain. Then, a stronger low will move into the ArkLaTex area by late afternoon. This low will probably pull the front and rainfall back west just slightly, perhaps bringing a brief respite from the rain from late afternoon through the early evening hours. However, as it moves northeast, rain and storms will move back into the area overnight Saturday night. Rainfall will be heavy with an additional 1-2" of rain expected Saturday night. It will continue to be exceedingly warm and humid Saturday with temperatures starting in the 60s in the morning and topping out in the lower 70s despite the rain Saturday afternoon. Gusty south wind can also be expected, especially Saturday evening and night. The front will move slowly across the metro between midnight and dawn Sunday with heavy rain and thunderstorms likely as well. Showers will continue throughout Sunday on the back side of the front with another half-inch of rain likely. As the front moves through early Sunday, temperatures will fall from the 60s in the wee hours of the morning to the upper 40s by dawn. Temps will continue to slowly fall throughout the day, reaching the upper 30s by dusk Sunday. Scattered showers will continue Sunday night with temperatures in the 30s. As cold air at the surface and aloft continues to move in, some rain could change over freezing rain or snow showers by dawn Monday, though any precipitation left over is expected to be light. It won't take much freezing rain to create hazardous conditions for the Monday AM rush with temps near 30 expected though! The best case is that precipitation completely moves out Sunday night before freezing air arrives. Monday is a little tricky still as computer models disagree on the amount of moisture remaining behind. Multiple models move another wave along the front to our east, spilling precipitation back over the area, which could be in just about any form with temperatures in the 30s all day - snow, freezing rain possible early, or maybe a cold light rain in the afternoon. One of the primary models, however, keeps us dry all day. 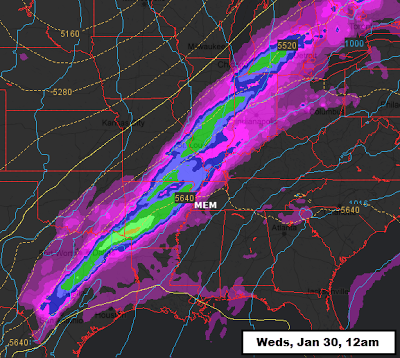 One computer model interpretation of possible freezing rain accumulation on Monday. This model gives the metro about 0.10" of ice, which, if it verifies, could cause problems for transportation and commerce. 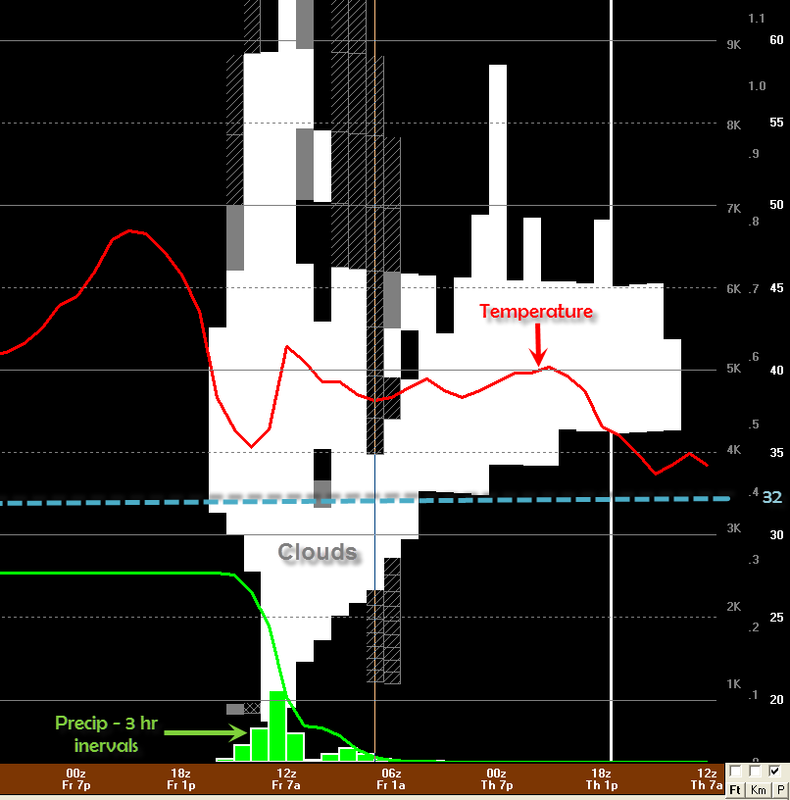 This is NOT a forecast, just a model interpretation, but it shows the the possibility of some icing. The forecast to start the work week is highly uncertain! It does look like the brunt of the precipitation will be well to our east Monday though, and the entire system will move out by Tuesday, leaving dry but cold conditions. Highs in the 40s are expected all week with lows possibly in the 20s. 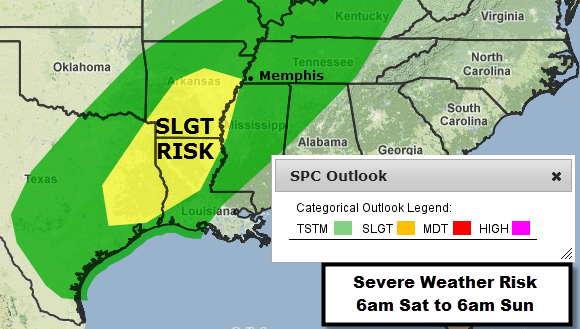 The Storm Prediction Center has the metro on the northeast edge of a Slight Risk zone on Saturday and Saturday night. The higher severe weather chances will be to our southwest, though some storms on Saturday could have strong, gusty wind. Overnight Saturday night, a squall line is possible just ahead of the cold front, which could also bring a threat of damaging wind. The tornado threat is low, however with sufficient shear in the atmosphere, they cannot be completely ruled out in the strongest storms. Instability will be higher with this system than it was Thursday night, when a lack of unstable air resulted in showers but no thunderstorms in the metro. A slight risk of severe thunderstorms is currently forecast just southwest of the Memphis metro on Saturday into Saturday night. Damaging wind would be the primary threat. 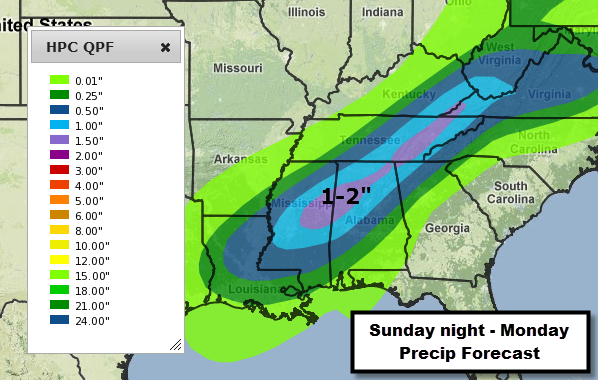 Stay tuned to MemphisWeather.net via the links below for the latest on our wild weather weekend! We'll be sure to keep our social channels and forecast updated throughout the next several days. Though it didn't necessarily form in the classic sense, a "wake low" developed this afternoon and moved across north MS. 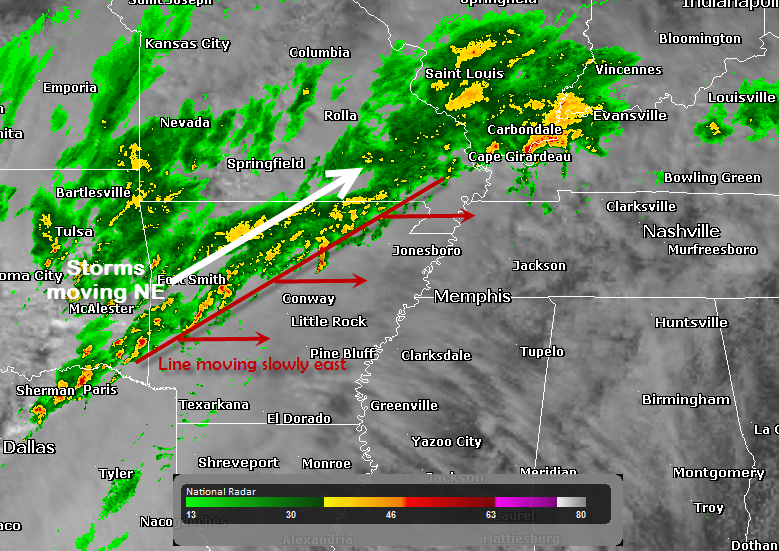 The northern edge of the feature brushed the Memphis metro. So what is a wake low and what did it do? Wake lows occur infrequently and bring strong and gusty wind to the area affected. In some cases, high wind of 60 mph or more can result from the sinking air associated with these mesoscale (small-scale) features. They typically trail precipitation areas, most of the time forming on the back side of a "meso-high," or small area of high pressure that forms behind a squall line or decaying thunderstorm area. In today's case, though we had precipitation that was moving out about the time the low formed, there was no squall line to trigger the formation of a meso-high. The small low pressure area is formed when air rises into a precipitation area, leaving a "hole" of lower pressure in it's wake. The air that is forced upwards then descends back down into the trailing low pressure area, trying to achieve equilibrium. The air can descend fast enough to hit the ground with some force and spread out, creating a high wind event. Diagram of a wake low. Credit: UCAR. In general, wind speeds in the metro were in the 30-40 mph range. According to MLGW, as many as 7,400 customers were left without power following the strong wind that occurred between 3:30-4:00pm this afternoon. Trees and power lines were down and some poles were toppled or shifted due to saturated ground from the 1.5-2.0" of rain we have received in the past 36 hours, further complicating restoration efforts. The wake low has continued to move across north MS into central AL. At 5:15, Tupelo law enforcement reported trees and power lines down and as of 8:30pm reports of wind gusts up to 60 mph have been received from Tuscaloosa, AL with numerous power outages and blown transformers (credit: NWS). A previous MWN Blog post on the topic from July 2010 includes radar imagery of the wake low, which was much more pronounced due to the presence of precipitation with it. Damage was also reported with that event. UPDATED 9:15pm: The slight risk area has been dropped from the Mid-South and bands of showers and a few thunderstorms are forming over northeast AR and west TN. Though brief heavy rain and wind gusts are likely with any showers, the severe weather risk appears to have not been able to materialize. As usual in the winter, instability was the biggest factor and there just wasn't enough to get strong storms to form. Showers will linger through midnight or so. Clouds will break apart in the morning leading to a partly cloudy afternoon with highs in the lower 70s! UPDATED 6:30pm: The Storm Prediction Center has issued a "mesoscale discussion" which basically outlines the state of the atmosphere and let's us know what they're thinking relative the potential for severe weather. In it, they state that a watch is unlikely (20% chance of issuance) due to a lack of suitable instability to promote widespread thunderstorm development. SPC does not expect to have to issue a watch for the area tonight, though a few storms are still possible. While some thunderstorms are still expected, most will be to our north and even those will have a hard time reaching a severe state. We still expect you could hear some thunder tonight between 8-11pm and the wind could get gusty in some storms. By midnight, the threat will be over and we can look forward to a delightful spring day tomorrow! Yes, a good deal of sunshine and 72 degrees is the definition of a spring day! Enjoy it, more rain (lots of it) is on the way this weekend. 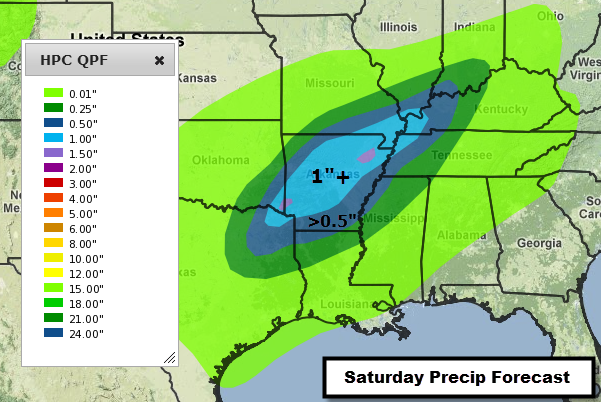 The Mid-South has entered a very unsettled, wet pattern that will continue into early next week. Despite a 12-hour period here and there with drier weather, the overall pattern will favor waves of rain and chances of thunderstorms until next Tuesday or Wednesday. Rain encompasses the area this morning as moisture streams in from the south. Currently (9:45am), Tornado Watches are posted for portions of Louisiana and southern Mississippi where the greatest atmospheric instability (rising air) is located. However, during the day, some of that instability will extend north towards our region as a potent upper level system nears the area from the west (see graphic below). Upper-level energy, in the form of a low pressure center, will skirt the region, bringing a chance of strong storms this evening. As the upper low approaches, thunderstorms are expected to develop later this afternoon in AR and move towards the metro. Besides heavy rain, some of these storms could bring the potential for strong to damaging wind with an isolated threat of hail or a tornado. 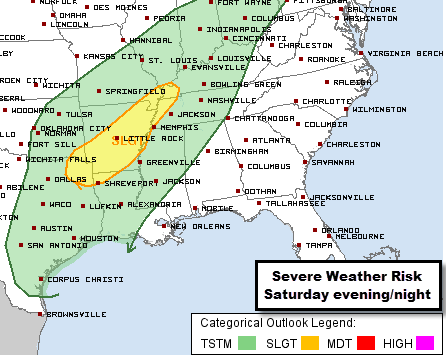 For this reason, the Storm Prediction Center has placed portions of the Mid-South under a Slight Risk of severe storms, primarily during the 8pm-11pm timeframe in the metro. While atmospheric dynamics, such as wind energy, are sufficient for severe weather and moisture is in place, ongoing rainfall (especially if rain continues this afternoon) will inhibit the final ingredient needed for severe weather - instability. Should we get a break from the rain this afternoon (which models indicate is possible) and warmer dewpoints in the lower to mid 60s make it into the area, our severe chances would materialize. The Slight Risk is forecast due to this possibility. If instability is more limited, strong storms would be possible but the severe weather risk would be limited as well. Once again, damaging wind is the main threat, but there is a non-negligible risk of a tornado as well. As always, we'll keep you updated on social media throughout the day and tonight and will provide wall-to-wall coverage on Facebook and Twitter if thunderstorms form. 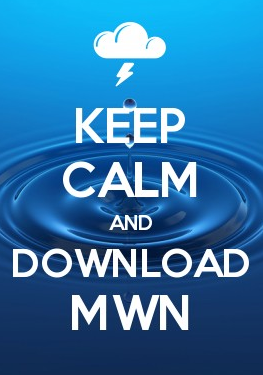 Download the MWN mobile apps for the most current information we publish, including radar, local conditions, the latest forecast, watches/warnings, and links to our social feeds. Then, upgrade within the MWN app (on the Alerts tab) to StormWatch+ to receive pinpoint warning information delivered to your Android or Apple device, including Severe Thunderstorm and Tornado Warnings that will wake you up if need be. All pertinent links are listed below. 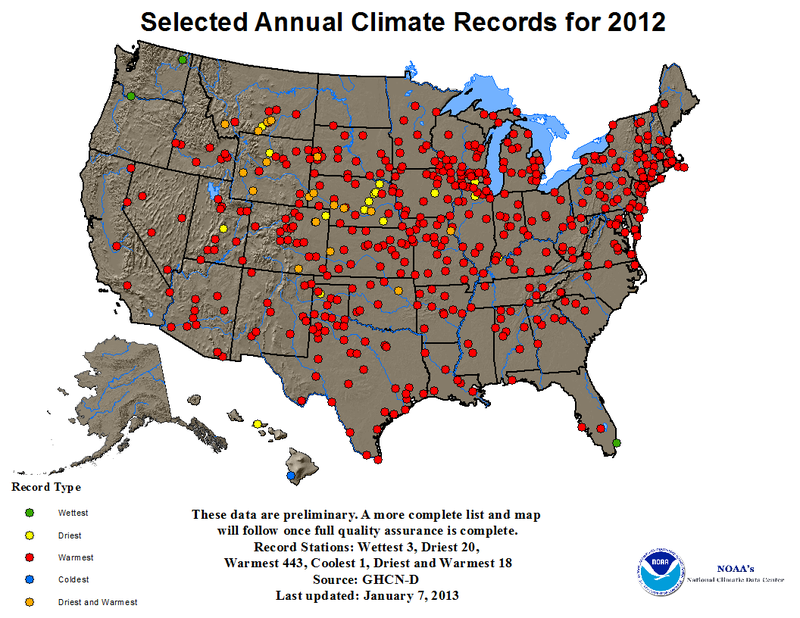 2012: Warmest Year on Record, in Memphis and the U.S. Apparently Memphis wasn't the only hot spot in the good ole' USA this year! A just-released report from the National Climatic Data Center (NCDC), a division of NOAA, states that 2012 was the warmest year on record in the continental U.S. In 2012, the contiguous United States (CONUS) average annual temperature of 55.3°F was 3.3°F above the 20th century average, and was the warmest year in the 1895-2012 period of record for the nation. The 2012 annual temperature was 1.0°F warmer than the previous record warm year of 1998. - NCDC, "State of the Climate"
NCDC goes on to say that preliminary records show 461 recording stations across the CONUS set high temperature records for the year, while 38 stations set a record for minimum precipitation in a year. Twenty of these station set both records in 2012. Nineteen states recorded their warmest average temperature on record (those marked "118" in the map below), while all but 3 (Georgia, Oregon, and Washington) of the contiguous states finished in the top 10 warmest for their state. Nineteen states experienced their warmest year on record, while only 3 states did not crack their top 10 warmest. Precipitation averaged across the CONUS in 2012 was 26.57 inches, which is 2.57 inches below the 20th century average. Precipitation totals in 2012 ranked as the 15th driest year on record. Two states recorded their driest year ever, while a large part of the country experienced well below normal precipitation. For the complete NCDC report containing a great deal of detail on events and records of 2012, read the State of the Climate report, or the Summary of the SOTC report. Yesterday (January 6), the Memphis metro saw it's first 50-degree day since Christmas Eve! Typically 52 degrees wouldn't feel that warm, but in the context of 30s and 40s the past week and a half, it was rather pleasant! While today's weather is much like yesterday, more "spring-like" weather is expected for the rest of the week. And with springtime temps typically comes spring storms - this week will be no exception. The culprit for this week's wet weather will be an upper level low pressure system that will move out of Baja California across northern Mexico and into Texas by Wednesday. It will then lift north-northeast towards the Midwest on Thursday and weaken somewhat. An upper-level low over central TX Wednesday evening will lift north-northeast by Thursday. The track is not particularly favorable for severe weather in the Mid-South. As the upper-level low moves northeast, surface low pressure over Texas will begin to lift north during the same time frame. A warm front extending east from the low will lift towards the region Wednesday, bringing increasing rain chances and the possibility of some thunder as it moves through the region Wednesday night. As the surface low moves northeast Thursday, it will drag a cold front through the Mid-South. The cold front will encounter unseasonably warm and moist Gulf of Mexico air in place over the region and thunderstorms will be a good bet, probably Thursday afternoon. Precipitable water values Wednesday evening show high moisture content in the atmosphere ahead of the approaching weather system, meaning the possibility of heavy rain. As low pressure in OK lifts northeast Thursday, the cold front entering western AR will move through and could bring a round of thunderstorms. The Mid-South will be in the "warm sector" behind the warm front all day. Meanwhile, a warmer pattern will begin to take hold this week and will be augmented by the arrival of the Gulf airmass. While temps will approach 60 on Tuesday and Wednesday, highs Thursday ahead of the cold front could reach 70. Behind the front, the airmass moving in will be of Pacific (not Canadian) origin, so mild temperatures will continue on Friday, which may also see highs approach 70. Another system will move in for the weekend, bringing high rain chances once again. Much cooler temperatures will trail that system as we end the weekend and start next week. 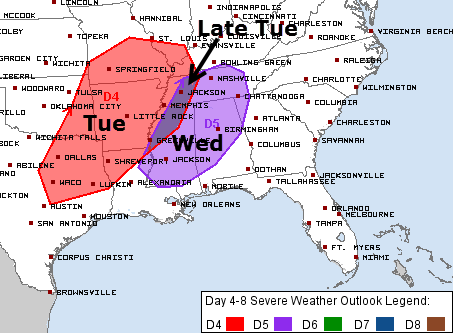 While the threat of severe weather does not look particularly high on Thursday, an isolated severe storm cannot be ruled out, with damaging wind being the most likely threat it appears. Any storms on Wednesday or Wednesday night would be "elevated" in nature (meaning the lift within the storms does not originate at the Earth's surface), so thunder and lightning will be possible, but the severe weather risk is very low. 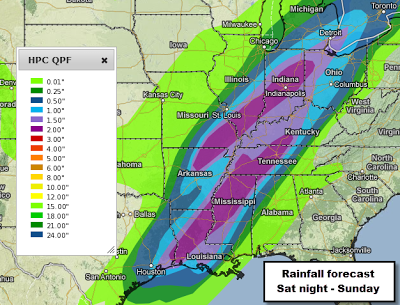 The main concern with both systems in the coming week will be heavy rain. And considering the lack of rainfall over the past several months, this may not be a bad thing. Rainfall totals of 2-3" are very possible with the mid-week system while another couple of inches is definitely possible this weekend. Projected 7-day rainfall amounts through Monday, January 14. 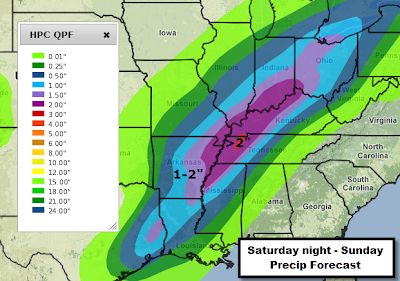 The Mid-South could see 4-6" rainfall totals from the next two weather systems. We'll keep you updated as the week goes along. Follow MWN on Facebook and Twitter for the latest info and download our iPhone or Android app for the most recent forecast and always-current StormView Radar, as well as severe weather warnings for the location(s) nationwide that YOU are most concerned about. Our complete forecast can be found here on MemphisWeather.net. Temperatures once again averaged well above normal, while precipitation was below normal, with the year ending in the top 10 driest on record. Drought conditions continued to abate, even though rainfall was below normal. Most of the Memphis metro is now classified as being "abnormally dry," which northern Shelby and Tipton Counties are still in a moderate drought. The month also saw the first snowfall of 2012-2013 winter with about an inch in most areas of the metro (slightly more north and less south) beginning around midnight Christmas night and lasting into the morning hours of the 26th. In addition, there was one severe weather event, on December 9th, which produced hail reports in the metro and strong wind gusts. Year-end statistics will be reported in a separate blog post, but the average Memphis temperature for 2012 set a record for the warmest on record, averaging 66.0 degrees, 0.4 degrees warmer than the previous record high set in 2007. The average temperature for the month of December was 49.8 degrees, or 6.2 degrees above normal, which ranks as the 8th warmest December on record. The average high temperature was 58.0 degrees and the average low was 41.5. The coolest temperature of the month was 21 degrees on the 30th, while the highest temperature was 75 degrees on the 3rd, which also tied a record high for the date. There were 9 days on which the low temperature fell to freezing or below. Precipitation for the month totaled 3.73", which was 2.01" below average. There were 17 calendar days with measurable rainfall, but only 3 saw totals of 0.50" or more (maximum 0.92" on the 9th-10th). Snowfall from the December 26th winter storm produced 0.9". The peak wind gust was 47 mph from the west on the 20th with an average wind speed for the month of 8.5 mph. Click here for a daily statistical recap for Memphis International Airport. The average December temperature at Cirrus Weather Solutions was 48.2 degrees (0.1 degrees warmer than November) with a maximum of 75.1 degrees on the 3rd and a minimum of 18.4 degrees on the 30th. December precipitation measured 4.36" via the Cirrus automated gauge and 4.35" in a manual gauge used for the CoCoRaHS program (which included about 0.10" that fell in the early morning hours on January 1). Snowfall on December 26 totaled 1.3". The measured peak wind gust was 34 mph on the 20th. Average relative humidity was 80%. Click here for a daily recap on MemphisWeather.net. For the month of December, the average temperature error in all MWN temperature forecasts was 2.37 degrees, lower than all available full-range computer model data and the National Weather Service. More than 65% of the MWN temperature forecasts for the month were within 2 degrees of the actual temperature. MWN's forecasts extend out five periods (2.5 days, or roughly 60 hours). For dewpoint accuracy, the MWN forecast averaged 2.70 degrees of error and fell within 2 degrees of the actual dewpoint nearly 55% of the time. Historical accuracy statistics can be found here. For the year, the average temperature error in all MWN temperature forecasts was 2.22 degrees. 66.8% of the MWN temperature forecasts for the month were within 2 degrees of the actual temperature. For dewpoint accuracy, the MWN forecast averaged 2.65 degrees of error and fell within 2 degrees of the actual dewpoint over 59% of the time.